I’ve always always liked the idea of conventions and expos, places where people of certain specialties come together to sell their wares, unveil exclusive prices or items and maybe rub elbows with one another to share trade secrets or contact information. Travel Tour Expo is one of those events. Some of the biggest names in the local travel scene make appearances and give out the best of deals during this time. Not only that, but presentation is key as well. Booths are often colorful, but the best of companies really bring out the big guns when it comes to contests, waiting area design and booth aesthetic. But it wasn't just travel booths set up but various other stores including some food stalls for hungry travel bargain hunters. Much like last year, the first day was a pretty soft opening. People eased into the event area after a while and a buzzing of visitors could be heard soon enough. As always, people from different companies and businesses had to set up as quick as they could to get everything at at least 85% done before the doors would open and let the first wave of eager travel enthusiasts in the door. There were, of course, some differences in booth styles and extravagance. Some companies had bare-bones decorations, like tarpaulins with big announcements or the company name on it and hundreds upon hundreds of photocopied flyers. But despite their lack of big decorations, they had some of the best packages I could scope out. Their prices were so low, I was almost tempted to buy myself a dream trip to Japan. Obviously, the much more prominent companies like airlines accommodations could afford to go all out with all kinds of furniture, displays and other items to brighten the surrounding areas. The event of the day started with a bang… Ryan Bang that is. The television personality slash actor slash comedian was present at the event and took to the stage to give the people a little show to get things rolling. He also did a bit of promotion of his home, South Korea, because who else is best suited to promote a country than a native who has lived there with considerable sway over the masses? His status as a celebrity in the Philippines definitely gave the stage a bit of attention and some enthusiastic lady even got up the stage to strut her stuff. Walking around the area, you could see that some of the booths were interactive, giving visitors a chance to play for fun and even some small prizes. Most of the day was focused on booking though, as day 1 is generally a premiere event before the big 2nd and 3rd days of the Travel Tour Expo. That said, it seemed like a lot of people were interested in interacting with these booths. There isn’t much of a difference from last year, but the event is still a pretty enjoyable venture top check out. The deals are all pretty great, The different displays and flyers are fun to look at and collect and there are a few food stalls to visit when you get hungry (though these are often crowded so you’ll need to secure a seat fast). It’s also worth noting that this is only the first day. The 2nd and 3rd days are when the event usually busts out the heavy artillery (aka even bigger deals, contests, sign up forms, etc.) so if you were planning to give the expo a visit, now would be the best time to make the trip to the SMX Convention Center in Pasay City. Booths: 4/5 It’s your typical travel expo favorites. While nothing seems entirely new, it’s still fun to go around and check out one after another. Entertainment: 3.5/5 Definitely had the expo feel to it. The stage shows were pretty enjoyable as well. Deals: 5/5 This is definitely the main reason to go here. Japan, China, Dubai, South Korea. All the biggest travel destinations being endorsed by the biggest names in travel at some crazy low prices! You can still check out the PTAA Travel Tour Expo 2017's 2nd and 3rd day right now, Feb. 11, and tomorrow, Feb. 12, for more great deals on travels for the year! To locate the Mango Tours in the expo area, locate booth #190-191 at the SMX Convention Center in Pasay City. Global News: The Search for Next Boracay, Festivals in Europe, and more! 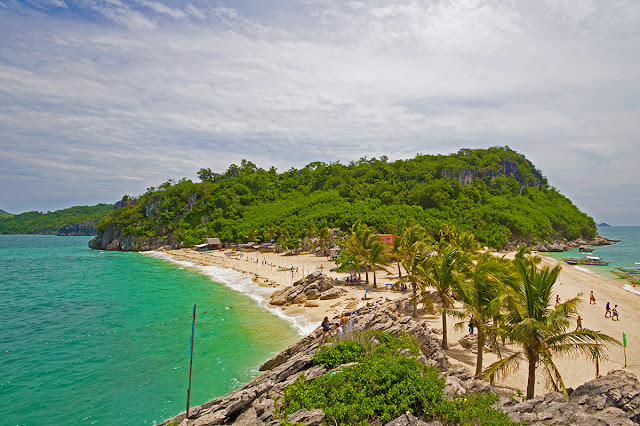 Iloilo’s Islands Could Be the Next Boracay While different from the beach party vibe of the island of Boracay, Iloilo’s Isla de Gigantes (Island of the Giants) may just be what the wandering beachgoer might be looking for when it comes to sand, sun, and fun. From a smorgasbord tasty seafood dishes, hidden lagoons, uncrowded beaches, and several islands to check out, there’s definitely a lot of appeal in low-key destinations like this for the upcoming vacation season. Gifts for the Traveling Mom With mother’s day on the horizon, it can be a bit of chore trying to think of the perfect gift for your travel-savvy mom. Fortunately, online lists can make gift picking easier, faster, and much simpler. Whether she’s a seasoned globetrotter or a tourist fresh off the ground, your mom will definitely appreciate fantastic travel-related gifts on the biggest day of maternal appreciation. Have you tried a Mango Scoop? Not the luscious fruit the best of which is grown in the Philippines, or the ice cream that is a fave flavor of Filipinos. Mango Scoop is what arrives in your email inbox about 3 times a week if you’re a friend, a customer, or just a watcher of bargain flights to the Philippines, Asia, and some European destinations. Mango Scoop is the attractive e-newsletter of Mango Tours, the latest of which (September 28 issue) lures you with tour packages to Thailand, a promo fare of $597 to the Philippines, and such interesting reads as hard-to-kill houseplants for frequent travelers, and technological advances in the travel industry. To interact with readers, the site asks you to share your travel stories on social media #MangoToursTakesYouThere. Read more from the original post at postivelyfilipino.com. Which country reigns in this year’s hierarchy of own Southeast Asian passports? This information is especially sought after by travelers who want to know how far their documents can take them. 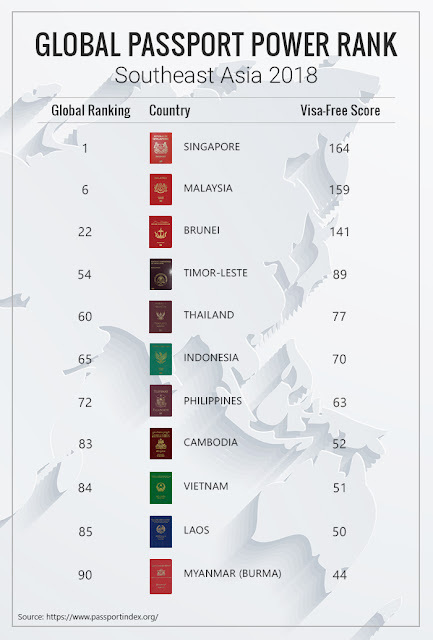 Below is the ranking of Southeast Asia's passports and their corresponding total visa-free scores according to the 2018 Partners Passport Index. Singapore, which placed 4th last year, tops the list with access to 127 visa-free and 37 visa-on-arrival destinations. Global News: Taiwan Visa-Free Travels, Coron On The Rise, and more!